How many times have you heard someone say "it's just an honor to be nominated" and rolled your eyes? I'm going on the record today to say that it's true. 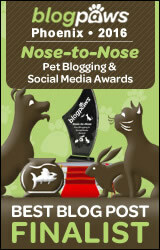 A few weeks ago I asked you to consider nominating us for the 2016 Nose-to-Nose Pet Blogging and Social Media Awards. 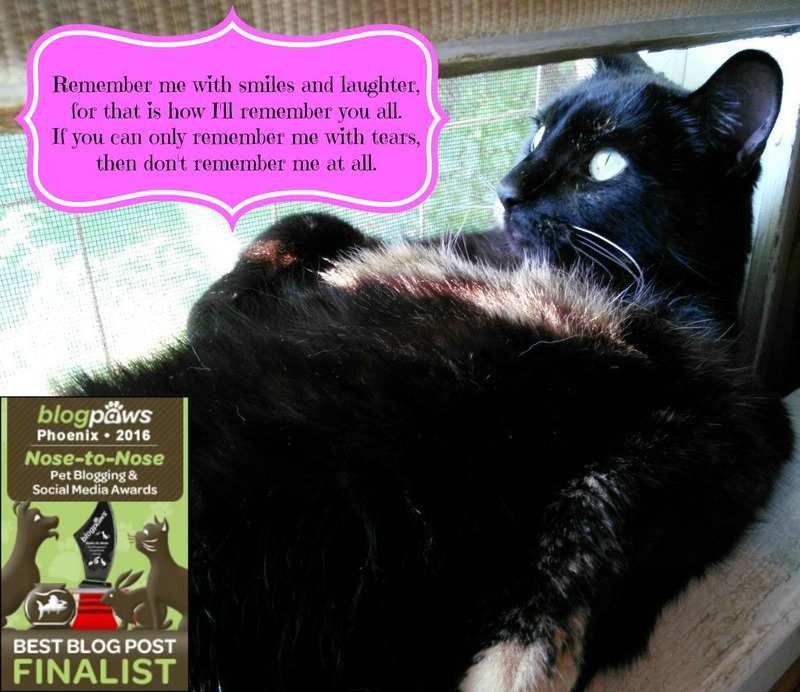 Tuesday evening I received an email that my dream came true...Truffles' farewell post Dispatches from the Bridge: Remember Me is a Finalist in the Best Blog Post category. I feel like I've been floating on Cloud 9 since hearing the news and have shed more than a few tears too. My precious, tragic little angel is still touching peoples' hearts nearly a year after her death. Blogging sometimes feels like a very solitary endeavor and it's easy to feel like a small fish in a large pond. Many amazing bloggers never get the recognition they deserve, so to receive such an honor for a post that means more to me than anything I've ever written is almost beyond my comprehension. It's 100% the truth when I say that I still can't read that post without crying and I doubt that I ever will. A friend on Facebook wrote that Truffles is purring with pride from above and I'm sure that's true. I only wish this post never had to be written and that she was still here with me today. Winners will be announced on Saturday, June 25th at the BlogPaws 2016 conference in Phoenix, AZ. A complete list of finalists in all 12 categories can be found here. Please join me in congratulating everyone for a momentous achievement, and I thank you all from the bottom of my heart for your love and support! Concatulations on being a finalist!! A BIG congratulations to you - it's so well-deserved. I've been saying that a lot the past day or so, but I mean it double when it comes to Truffles' blog post. My heartfelt congratulations, Melissa! I know this is a bittersweet sort of win for you, and that of course you still wish your Truffles was with you, but this is the most wonderful and well-deserved honor to her memory. You truly deserve this, Melissa, and I'm certain that your beloved Truffles is indeed purring with pride right now. Congratulations! It truly is a beautiful post. Congratulations on being a finalist! I am so happy for you. This is praise indeed for your love for Truffles! Bravo to that loving blogger able to pay such a loving tribute. Congratulations, Melissa! What a wonderful way to honor Truffles' memory - and while I, too, wish you never had to write the post, I'm glad that the post, and you, are receiving this recognition. I know Truffles is smiling. Congratulations! The post is a beautiful tribute to Truffles. Hugs, to you, and a wonderful honor in Truffles memory. I can only imagine the way Truffles must be smiling down on you from her high perch at the Bridge! Congrats on being a finalist; I can't imagine a more deserving blog post! I wasn't immersed in the blogging world when this post originally debuted, so I never got to know Truffles. But when I read this post, I shed a tear and can only imagine how hard it was to write. It's beautiful, poignant and perfection. Congratulations on a well-deserved nomination. Congratulations! I just saw that you also won a Certificate of Excellence from CWA. Both honors are well-deserved! That post was so heart-felt, so clear, expressive and poignant. I'm very happy you were nominated (although the reason for the post was so sad and tragic). We are definitely rooting for you to win! YaY! Well deserved. That post touched me deeply, for it expressed a lot of what I was feeling with the loss of my Callaway about the same time. Truffles is surely purring, and making sure her paw print is forever in your heart. Concat Concat Concat! It is a well deserved nomination and a beautiful post to "our" sweet little Truffles! Such a touching post, I can't think of a better tribute to your beloved Truffles. All our paws will be crossed for you on the night. Concats on the honor. Maybe you can go to BP’s now. Congratulations, Melissa! Well deserved. Hope to see you there! I'm so happy for you that this beautiful post is a finalist for the awards. Concats also on your CWA Certificate of Excellence. Your post is so special, and a wonderful tribute to sweet Truffles. We're so, so happy that you're a finalist, Melissa! Congratulations!!! Awesome congrats! I hope this means you'll be going? Congratulations, Melissa! I'm just so thrilled for you. You deserve this so much.